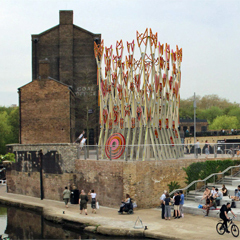 Temporary pavilion to be installed in King’s Cross for the London Festival of Architecture conceived as a speaker's room for public conversations and lectures. It is an immersive room wrapped with an ornamented dress that will be changing depending on the events. It will be open to the public during June 2019 and it's organized by the Museum of Architecture. 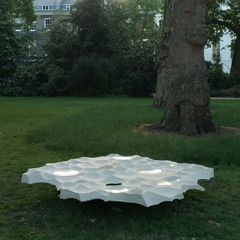 As Unit Masters of Diploma 5 at the A.A. from 2009, Cristina Díaz Moreno and Efren García Grinda were selected to design and construct the annual tradition at the AA, the Projects Review Strawberry Table. amid.cero9 received the Third Prize in the open competition for the Roman Cloacae of Calahorra, La Rioja, organized by Ministerio de Fomento. In the words of the jury members the project was awarded due to its poetic idea of lifting the skin of the pavement, to get to see the subsoil and thereby to allow access and visualization to the maximum of the Roman remains. 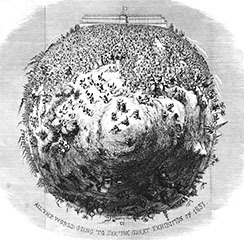 At the same time, this skin, when folded over the Roman remains and the party walls, allows the partial covering of those, creating a series of steps on which to contemplate the public space, organized through what the jury considered a powerful circular geometry. 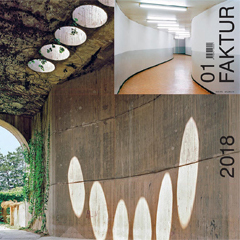 Amid.cero9 has published an essay entitled Alternative Beauties in the first issue of FAKTUR, a new journal edited by Pep Avilés that celebrates research as the source of architectural imagination, responding to the concerns of an emerging generation of architects and aiming to bridge the distance between practice and academic scholarship. Amid.cero9 will be part of the 2019 Seoul Architecture and Urbanism Biennial under the theme “Collective City”. 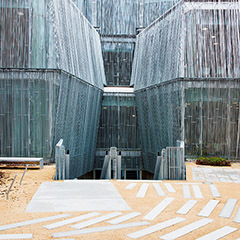 The proposal, based on an investigation on jjimjilbangs – Korean Bath and Sauna houses, will include a publication and a piece for the Exhibition Hall of Dongdaemun Design Plaza designed by Zaha Hadid. 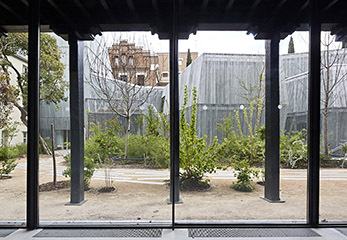 Talk by Cristina Díaz Moreno and Efrén García Grinda as a special visit to the Francisco Giner de los Ríos Foundation and its hidden garden, connecting concepts such as stereoscopic vision, strabismus and construction through the gaze. Main Auditorium Polytechnic University of Valencia ETSA-UPV, Cátedra Blanca, Matter and Form 8, sponsored by CEMEX. 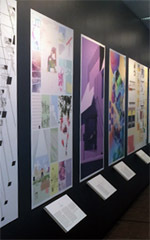 Solo Exhibition by amid.cero9 at SOA Princeton University School of Architecture, Princeton, New Jersey. The exhibition presents amid.cero9’s investigations on the role of architecture in the formation of the contemporary public realm through large format drawings and precious models recreating the working environment of their studio in Madrid. 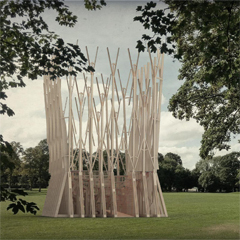 On the occasion of the Wirral Borough of Culture 2019 the Wooden Alphabet pavilion will travel to Wirrall for some months and different dresses will be covering the wood structure during the events. It will be included in the Art Outdoors program. 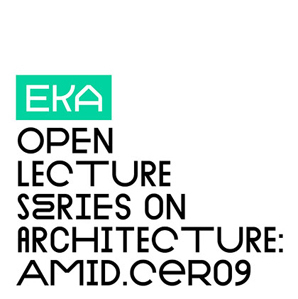 Lecture by Cristina Díaz Moreno & Efrén García Grinda about latest amid.cero9’s work at Chalmers Technical University, Gothemburg, Sweden in the Public Lecture Series of the School of Architecture. 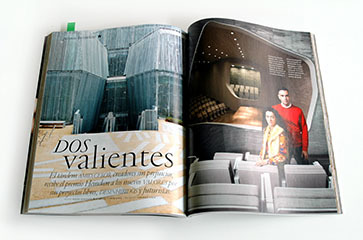 Cristina Díaz Moreno and Efrén García Grinda were part of the Jury Panel of the Master Thesis at the IKA Media Lab, Akademie der Bildenden Kunste, Vienna, Austria. 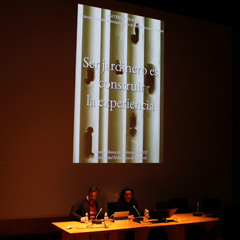 Lecture by Cristina Díaz Moreno & Efrén García Grinda about the work developed in parallel to the Institución Libre de Enseñanza project and amid.cero9’s work at the main auditorium in the brand new building of the Estonian Academy of Arts, Tallinn, Estonia. 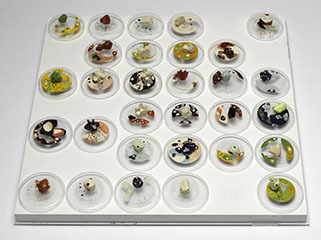 The series is curated by Sille Pihlak and Johan Tali. SOA Princeton University School of Architecture, Princeton, New Jersey. Now we lay us down to eat and talk: a conversation among students, amid.cero9 (Cristina Díaz Moreno and Efrén García Grinda) and Michael Meredith. A second enactment of Vaults Beds Gardens as a communal bed to trigger a conversation about Public Hedonics and Alternative Publicness. 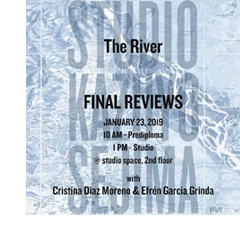 Cristina Díaz Moreno and Efrén García Grinda Guest Critics for the Finals of the 2018 Fall Semester of the Studio Kazuyo Sejima entitled “The River”, at the Institute of Architecture of the Angewandte, University of Applied Arts Vienna. 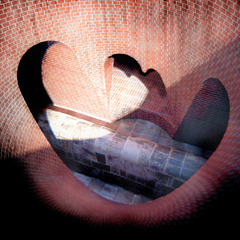 A talk by amid.cero9 at the Avery Hall, for the Graduate School of Architecture, Planning and Preservation. 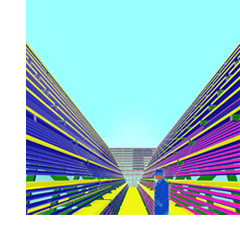 Fall Lecture Series Columbia GSAPP, Columbia University, New York. Response by Anna Puigjaner. 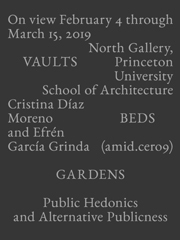 Cristina Díaz Moreno and Efrén García will lecture about the amid.cero9’s work in the Betts Auditorium at the SOA Princeton University School of Architecture, Princeton New Jersey, as part of the Fall Lecture Series entitled Speculation. 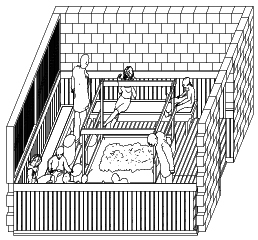 Le Jardin des Prodiges Portables, the book. 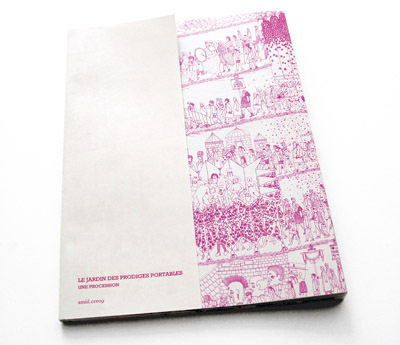 The new series of publications gathering the work by amid.cero9, is being presented in East London Comic Arts Festival London 2016 with the Le Jardin des Prodiges Portables, the first of the zines dedicated to single projects with profuse documentation and original drawings. 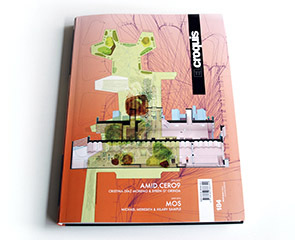 amid.cero9’s work including Institución Libre de Enseñanza, Aegean Paradise, The Golden Dome, The Carbonipherous Forest and other projects is extensively showcased in the new El Croquis issue, together with MOS, Michael Mederith and Hilary Sample's office. 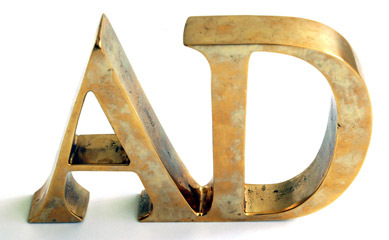 New adquisitions for the permanent collection of Pompidou by amid.cero9. 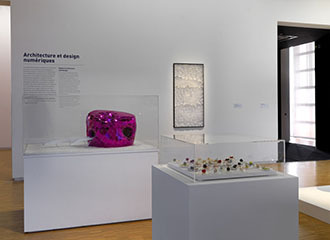 Models and drawings of the Cherry Blosson Pavillion in Jerte Valley and Black Cloud in Rome have been included in the permanent collection of the Centre Pompidou. The Wine Spray project for a wine fountain and a public space by amid.cero9 for Campo de Criptana (Ciudad Real, Spain) has been published in the marvellous brand new book published by Clubkova. Jerte Valley Cherry Blosson Pavillion models and drawings showcased in the exhibition Une Histoire, Art, Architecture et Design, des Années 80 à Aujourd'hui, the installation of the contemporary collections of the Centre Pompidou in Paris on display until March 2016. 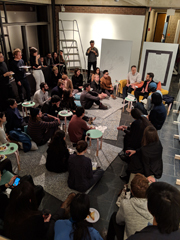 The Harvard Graduate School of Design’s eighth annual Platform exhibition is now on view in Gund Hall’s first-floor main gallery, including the work produced in the Pleasure Gardens Option Studio directed by Cristina Díaz Moreno and Efrén Gª Grinda. 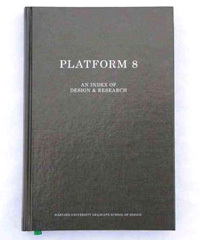 Platform 8 catalogs a curated selection of work generated in the academic year 2014-2015 at the Harvard University Graduate School of Design, including the Pleasure Gardens Option Studio directed by Cristina Díaz Moreno and Efrén Gª Grinda, published by Harvard University Graduate School of Design and Actar. 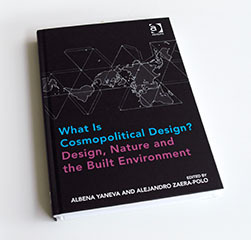 Cristina Díaz Moreno and Efrén Gª Grinda present the new GSD option studio for the Spring term at the GSD Piper Lecture Hall, focused on issues of language, typological imagination and subjectivity in the definition of interiorized public spaces in London. 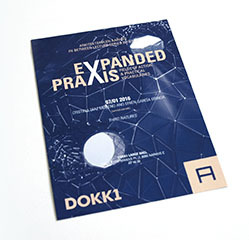 Third Natures, Lecture by Cristina Díaz Moreno & Efrén Gª Grinda in Extended Praxis series, Fields of Action & Practical Vocabularies, organized by the Arkitektskolen Aarhus, Dokk 1 Large Hall, Aarhus, Denmark. 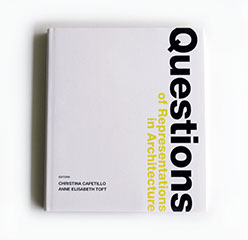 The new book on representation edited by Anne Elisabeth Toft and Christina Capetillo presents an interview to Cristina Díaz Moreno and Efrén Gª Grinda and publishes amid.cero9's latest projects and drawings. 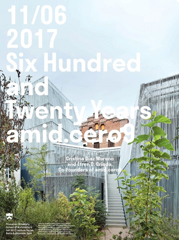 Legendary Institución Libre de Enseñanza in Madrid by amid.cero9 receives the 2015 ACI Award in the category of Sustainability and Social Contribution. Institución Libre de Enseñanza Project has been awarded with the 2015 COAM Prize, Madrid Association of Architects, with the 1st Prize of all categories. 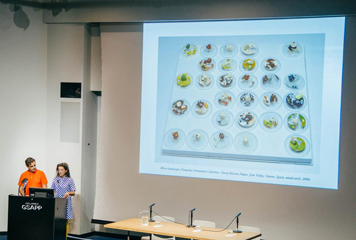 Cristina Díaz Moreno & Efrén García Grinda will be lecturing in the Main Hall School Of Architecture Of The University Of Cincinnati, as part of the Acadia 2015, organized by Chris Perri, presenting talks by Nadir Tehrani, Phillippe Rahm, Branko Kolarevic, Andrew Kudless, Achim Menges and Francois Roche. 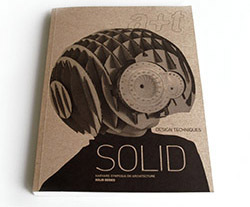 In an increasingly familiar world, a text by Cristina and Efrén about amid.cero9’s design techniques is presented in Design Techniques, A+T 45, the first volume of the SOLID series, a joined venture of a+t magazine and Harvard GSD. 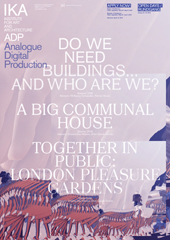 Cristina Díaz Moreno, Efrén Gª Grinda and Ben Reynolds will be presenting WILD, the new DIP5 brief 2015-16, focused on the contemporary relationships with technology and the subject of languages and subjectivity in architecture, at the Architectural Association Main Lecture Hall. 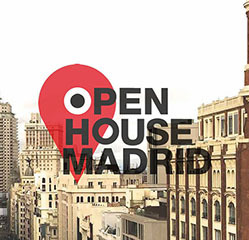 OpenHouse Madrid and the founder of Open House World Wide, Ms. Victoria Thorton, will present the Madrid program in the Francisco Giner de los Ríos Foundation, with the intervention of Efrén Gª Grinda and Cristina Díaz Moreno. 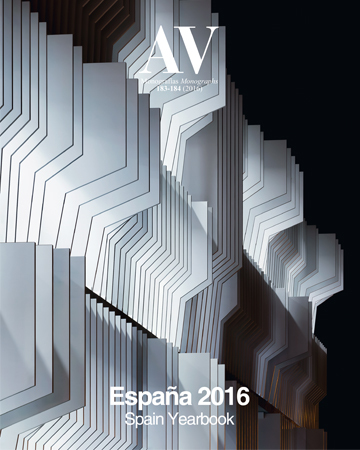 The work and projects by amid.cero9 have been awarded with the Prize New Values 2015 of the magazine AD Architectural Digest.